One thing is becoming a trend in the Nigerian political space. Powerful state governors after serving out their term, now see the Senate as their next destination. 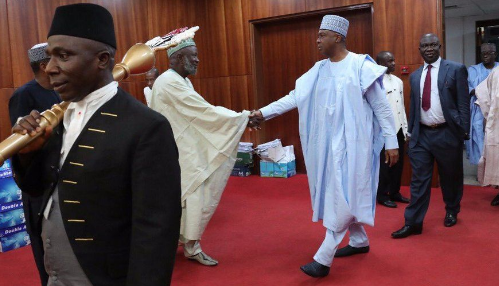 In the Eight Senate, 2015-2019, 15 former governors were elected senators. as about 15 of them scaled through in the 2019 National Assembly election, and will join others to begin legislative activities, after President Muhammadu Buhari inaugurates the National Assembly in June. They include: two ex-governors of Abia Orji Kalu and his successor, Theodore Orji, incumbent governor of Borno, Kashim Shettima, ex-governor of Ebonyi, Sam Egwu, ex-governor of Gombe State, Danjuma Goje, among others. Opinion, is, however divided on whether the former governors will make a difference in the senate. Some commentators opined that the governors’ mission in the senate is to feather their political nest. Others, however, said that the former governors would add value and quality to legislative debates because of their wealth of experience. Chief Egwu Chima, a chieftain of the All Progressives Congress, APC, in Ebonyi, described the election of the former governors into the senate as a welcome development. Chima, former Commissioner for Information and State Orientation in Ebonyi, said ex-governors would bring their wealth of experience to bear in the legislative activities in the senate. Chima said that former governors who served creditably in their respective states deserved a chance to go and show-case their leadership prowess at the senate. According to him, former governors have acquired enough experience that could be harnessed to advance the nation’s democracy through viable and qualitative representation. He said: “The best way for any governor that has served for eight years is to go and take a seat in the senate. The work load and expectations of the people on you as a governor are completely absent, the person will have full time to carry out his legislative functions. “If after serving as a governor and you retire to your house, you may decay fast, lose political relevance and may even die early. “As a lawmaker, the ex-governors will be able to direct their focus to the nation with the experience that they have gathered over the years on how to build strong, united and virile democracy. He advised ex-governors who are senators-elect from the different political parties to carry their experiences from their various sections of the country into the larger Nigeria. Prof. Jonah Onuoha of the Department of Political Science, University of Nigeria Nsukka, UNN, who spoke on the issue, also see election of more former governors to senate as a welcome development and something that would boast legislative performance. Onuoha who is also the Director, Institute of American Studies in the university, noted that the presence of more ex-governors who had acquired experience in governance would be an added advantage to the Ninth Senate. “These governors have acquired experience and know the needs of the people.With their wealth of experience they are in a better position to sponsor bills that will address the needs of the people in their states since they have first hand information about them. 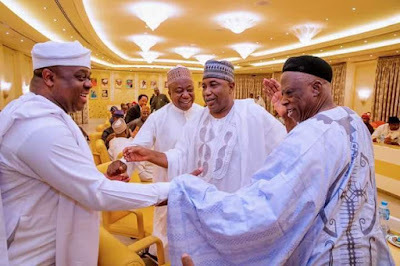 “Also with their connections as former governors they will use it to attract quality democracy dividends to their districts. To me, I see the election of more former governors into the red chamber as a welcome development, as well as a boost to the 9th Senate,” he said. The director said he did not subscribe to opinion in some quarters that the senate had become a retirement home for former governors as well as a shelter to avoid harassment from the EFCC. Prof. Aloysius Okolie, also of the Department of Political Science, University of Nigeria Nsukka, UNN, however, held a contrary opinion. He said that majority of these former governors were going to senate just to remain politically relevant and not to give quality representation to their people. “These former governors are going to senate just to remain politically relevant because some of them did not perform very well in their states, and that will not change in the senate. “Some of these governors in the 8th Senate did not sponsored any bill or done anything extra-ordinary,” he said. The former Chairman, Academic Staff Union of Universities, ASUU, UNN chapter, alleged that some of these former governors were rushing to the senate to avoid harassment from EFCC. “Some of these governors are going to senate as retirement home as well as a shelter against the harassment of EFCC. “Some of these governors were in government for eight years and could have allowed others to represent the district. “They have piloted affairs of their states, any development they did not bring to their people as governors, I doubt if they can do that as senators,” he said. In the same vein, Dr Paul Okorie, former Commissioner for Works, Housing and Transportation in Ebonyi, said that the former governors were driven by the desire to maintain their grip on the political space in their various states. Okorie said that some of the former governors that served in the previous senate did not show enough political fire work and quality representation, stressing that they were in the senate to feather their political nest. He decried the development and urged ex-governors who were elected as senators to place the interest of the country and their constituencies above personal considerations. “They should put the interest of the nation first, think more of their constituents and to remember first and foremost that their constituents are the people that elected them into the senate. “They should bring their experience as former governors to bear in the legislative process and thereby advance our democracy,’’ Okorie said. Chief Abia Onyike, a former Commissioner for Information in Ebonyi, said the new culture of going to the senate is a manifestation of former governors’ reluctance to leave office. “The new culture of going to the senate is a manifestation of their reluctance to leave office. “It has nothing to do with qualitative contribution to law making, in advanced democracies, you decide the direction you want to follow, either law making or governance. “The new generation of governors in Nigeria engages in endless search for relevance after leaving office. They are never satisfied with the opportunities they had, the reason is that the areas they governed were glorified provinces, after the balkanisation of the old regions into miniature states and the challenges of governance have become more intractable. “Many of them cannot satisfy the aspirations of the people, coupled with the powerful enemies they make while in office, they are constantly in need of a sanctuary, which some of them find in the senate,’’ he noted.